Talk about squeaking in under the wire—due to a lot of crazy circumstances this week, Fortune Cookie Friday almost didn't happen this week, but I pushed through! Even in the greatest confusion there is an open channel into the soul. Is that deep or what? This is going to be one of those posts where I use a situation in my own life to connect the dots on this fortune. There is "specific" confusion, meaning, confusion about one topic or theme. Maybe you're trying to learn something new and the topic is bewildering, or maybe you're putting together some furniture from IKEA and the directions (drawings, really) are utterly baffling. And then there is "generalized" confusion, such as: what direction to take when presented with two options or what you want to be when you grow up. I knew that my confusion could be resolved by finding the correct answers though diligent but efficient research, discussions with colleagues, and commitment to solving the problem or finding workable solutions. It seemed, though, that the more I clicked on various help topics to read documentation and Q&A, or the more people I talked to, or the more things that were out of my control happened, the more confused I got! This threatened to lead to exasperation when my problem wasn't getting solved as quickly as I'd hoped. I felt a lot of frustration, almost overwhelmingly so. This situation says more about me than about the problem (or its solution), though. At the end of the day, the problem itself doesn't really matter; it's how I handled it that does. At various points throughout the week, I was in danger of letting my frustration hamper my ability to think my way clearly through the problem. I was also in danger of letting the whole week be tanked by this stuff. Fifteen years ago, I would've been the kind of person that just threw her hands up, said "But I can't! Wah!" and just stopped trying. I'd have washed my hands of the whole thing when it stopped being easy to fix. But I didn't do that this time, and I don't, typically, any longer. Because there was a great opportunity for both soul work and learning new skills as I worked through it. I know that that I am easily frustrated at times, so instead of letting it all get to be too much, I used this as an opportunity to practice mindfulness, embraced doing the research, took breaks to do some calming breathing exercises, and even gave myself a few pep talks along the way. I did my level best to take the road blocks in stride, and also looked forward to the day when I could look back on this and say "Wow, I got through that. And now I know how to do X, Y, and Z." ...so I lumped it like a champ! I turned on some LED candles. I finished reading a book. Then I started another book. I let my brain turn over the problems in the background while I read these books by fake candlelight. Sometimes you just have to shut down and process, as long as you promise to get back to the problem when you are able. So anyway...is there a point to all this? Yes, I promise you, there is! 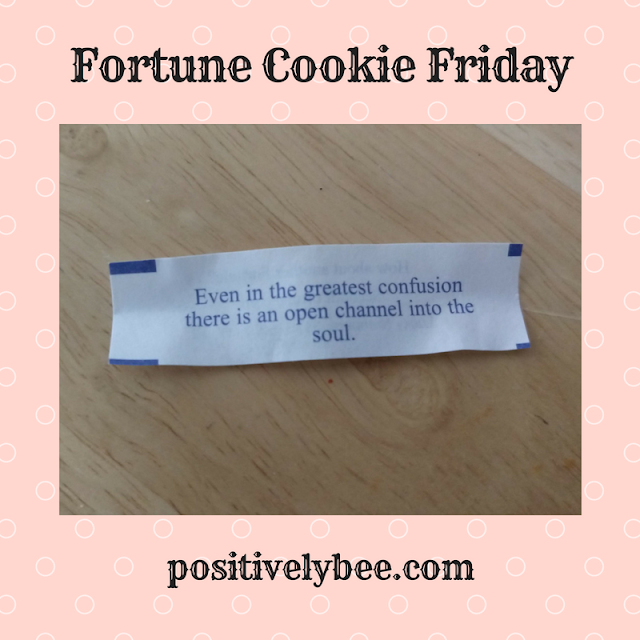 Let's tie it in with the cookie: "Even in the greatest confusion there is an open channel into the soul." There are a lot of pathways into the soul, and some of them are easier than others. The moments of confusion, or frustration, or what-have-you, can be just as impactful (if not moreso!) than the easy lessons in life. Those easy lessons may be a cakewalk, but do they really have that much positive influence on our overall growth or well-being? We can use any confusion we may feel to seek out the lessons, to do the work, and enrich our lives. Frustration, anger, and quitting when things get difficult can hurt our souls. When I kept quitting back in the day, I was passively harming myself: my sense of confidence and self-worth were pretty low. My ability to grow was stunted. Instead of using those lessons as ways to move myself forward, I stopped dead and stagnated. FOR YEARS. We all have the power—not just the ability, but the POWER—to heal ourselves if we embrace the difficulties, the confusion, the messiness...ALL of it. I contend that through confusion, we can know ourselves better, accept that we are worthy and capable and all those other things we cut ourselves down about, and bolster our self-confidence when we figure it all out eventually. You've heard the phrase "deep work?" Well I call this "deep soul work." Deep, deep soul work is absolutely accessible to us in these moments. Confusion doesn't need to be a roadblock. It is, indeed, an open channel. It's up to you to follow that path where it leads. And it'll be so worth it, even in the midst of any uncertainty you may be feeling, to navigate your way deeper into your souls, into your essences as human beings, connect with your true selves, and then find your way back out again and bring those attributes forward into your day-to-day lives. I would LOVE to hear your thoughts on this! Leave a comment below or drop me a line if you have any additional takeaways from this cookie's message, or about anything I touched on. Maybe you have a completely different interpretation? Let's explore this concept together!